If you want to contribute an album or favorite photos please send a note to webmaster@contraburners.org. 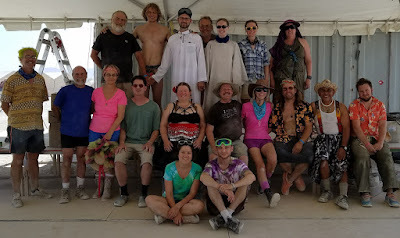 See our public FB page and search #contraburners or "burning man contradance" in various online venues. See the combined You Tube playlist (all years). See more 2018 video, photos and details. See more 2017 video, photos and details. See more 2016 video, photos and details. Ben Schreiber (Uncle Farmer), Scotty Leach (Retrospectacles), Chris Knepper (Triple Play), Audrey Knuth (Free Raisins), James Wilson (Bass); Callers: Michael Karcher (Seattle), Emily Rush (Rushfest! Durham), Frannie Marr (So Cal). 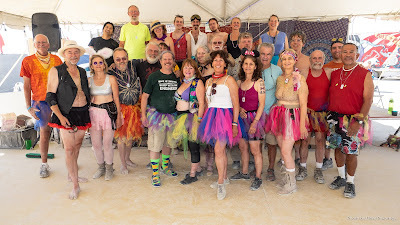 No camp due to the disastrous ticket lottery - but some of us put on a contra dance at SparkleSpaz HoboTron.